...a team of astrophysicists from Penn State University showed that there have been more upward-going high-energy particles than those detected during the two ANITA events. 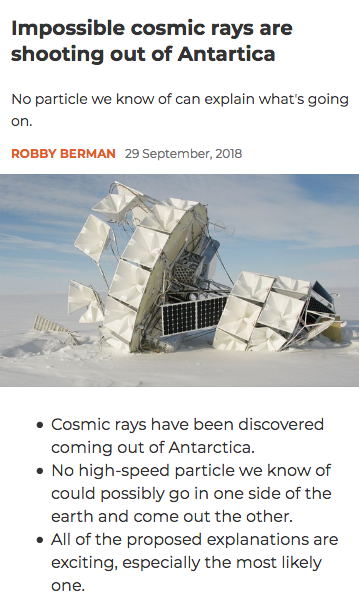 Three times, they wrote, IceCube (another, larger neutrino observatory in Antarctica) detected similar particles, though no one had yet connected those events to the mystery at ANITA. And, combining the IceCube and ANITA data sets, the Penn State researchers calculated that, whatever particle is bursting up from the Earth, it has much less than a 1-in-3.5 million chance of being part of the Standard Model.